Your cheese mixture: Cheddar, sharp or extra sharp, Jack, Montery or Colby Jack. Hi Jackie – I used a Colby Jack. This looks delicious. I looooove the picture of it baking. Those pictures make me hungry every single time. Hi Barbara! I’m so glad you enjoyed this dish, it’s a family favorite around here. You sure can make it photograph well too LOL! Thank you! This looks great, Barbara. I have family coming into town this weekend and this is so tempting because, well it looks delish, and I can make it ahead of time. I like your quick sauce too! This looks fantastic! I loved dishes like this. Cheesy, gooey, Italian! Looks like a must make! 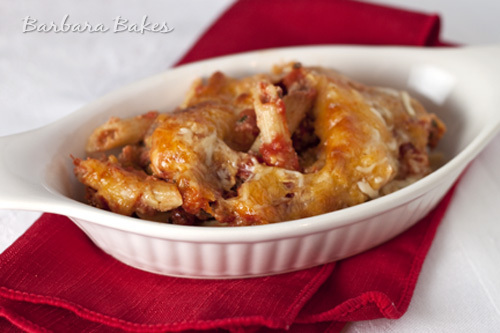 baked penne is one of my favorites. this looks SO good! 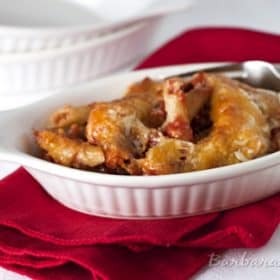 This is one of my all time favorite comfort foods! I ate it regularly growing whenever I visited one of my friends, but I haven’t had a good recipe to try it myself. I’ll be trying this soon! 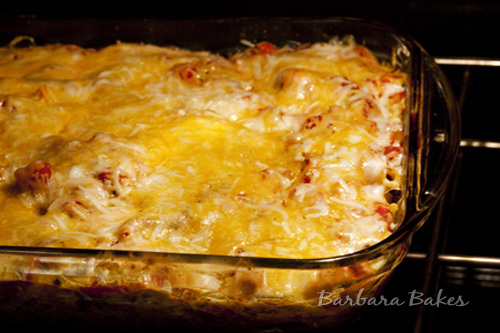 Thanks so much for sharing this baked penne recipe. I might make and freeze for the busy holidays! I love baked pasta, yours looks great! This is totally my idea of comfort food. Hot and creamy pasta on a cold day like today, I can think of nothing better. 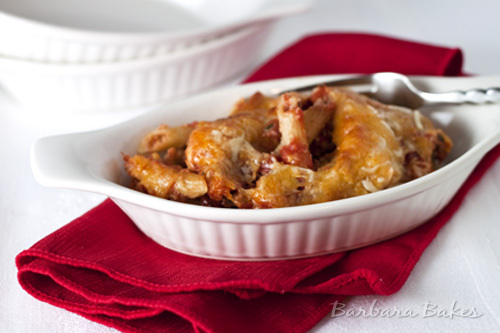 OMG…I’ve eaten so much sweet the past week, how I crave that whole pan of baked penne. My junior year of college, after going off the food plan, I think we made baked ziti ‘rigott’ (one of my roommates was Italian and that’s how almost every person of Italian heritage,t hat I know, pronounces it lol) at least once a week. Beautifully done, and something I would have chosen myself! My Oh My. Cheesy pasta deliciousness. Can’t beat it. This is definitely my idea of comfort food! Barbara I love watching the cheese too especially when it starts to bubble. Yum! I love the sound of your quick tomato sauce. I never would have thought to put garlic powder in it. Brilliant!